People often wonder what's going on behind those closed doors in their neighborhood. We're all guilty of it at least a little bit at some point. We ask our spouses or our friends questions, tip-toeing carefully around straight out asking what we want to know. Admit it, you've done it, too. In Other People's Houses by Abbi Waxman, we delve into those salacious events where we can only imagine. There are things happening behind those doors that we wish we knew, even if we really want no part of it. Those remarks, "I can't believe she wore that" or "Why is he with her?" have echoed around all our neighborhoods. For Frances Bloom, neighborhood carpool mom, those secrets come crashing into the open in full wanton glory. When she walks into her neighbor's house to pick up a forgotten crafting project, the idea of an idyllic neighborhood is crushed. Her friend and neighbor, Anne Porter, is splayed out on her living room floor engaging in full coital ecstasy with someone other than her husband. Once she tells her husband later that evening what happened, everything begins to unravel. Another neighbor, Bill Horton, is seemingly struggling in his marriage when his wife disappears. When Anne's husband throws Anne out of the house, Bill's home situation comes under scrutiny from the rest of the neighbors. Add in a lesbian couple simultaneously wishing and not wishing for another child, and you have a recipe for neighborhood brouhaha. It all comes to a head at a surprise birthday party. When the proverbial excrement meets the air circulating device, sides are chosen. Neighbors are pitted against one another, and sometimes even members of the same household face off. One ill-advised decision ricochets around the neighborhood. Abbi Waxman has written a novel that goes behind those closed doors and flings them open for all those secrets to fall out. She reminds us that even though we think we want to know what's going on, we, in reality, don't want to know. There are some things best left to the imagination. At the same time, she explores how fragile the even the closest of neighborhoods can be, with only one event pulling at loosened threads until it all comes crashing down. As I read this book, I felt as if the main character was less Frances and more the actual neighborhood. They are living and breathing entities, too. Think about your own communities. Think of how much changes when old neighbors move out and new ones move in. The dynamic alters ever so slightly. Add in a scandal like in Frances' neighborhood, and everything changes. Nothing can ever be the same. 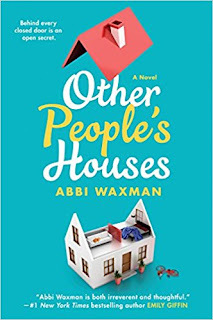 Other People's Houses by Abbi Waxman explores the relationships that make up a close-knit community. Each person has tremendous impact on the atmosphere of the whole. This novel was a very intriguing look when the decisions you make affect far more than you or your immediate family. It also shows how dangerous and hurtful rumors can be -- something we should all keep in mind. If you're looking for a good read for the summer while you're hanging out at the beach or by the poolside, try reading Other People's Houses. Waxman's tale will keep you engaged and turning pages. It's almost a soap opera in book form, with some cliches. And it's a lot of fun. Craig Bacon is middle-aged like the characters in this book, but he still acts like he's 17. Last summer he tried the Slip N Slide, but his middle aged body reminded him why it's a kids game.